nation’s capital does. The story of the Tower of Babel, which we reread in this week’s Torah portion, is receiving a contemporary reinterpretation on the National Mall. Yet in this post-modern theatrical revival, there are not one, but two towers. On either side of Washington, two severe ideological-political towers have risen, and each side has locked itself in, speaking to itself in “one language and one set-of-words”. Each side has its own blogs, newspapers, TV channels, court jesters, and of course its own “set-of-words” to describe the unfolding reality (the “Tea Party Shutdown” vs. the “Slimdown”). Hearing each side tell the story, one can barely correlate it to the tale being told in the other language. 'ויהי כל הארץ שפה אחת ודברים אחדים' – לא משום הדברים התעורר הקב"ה, כי אם בשביל שהיו אחדים, יהיו מה שיהיו... היו 'דברים אחדים' שביניהם לרועץ, שהחליטו להרוג את מי שלא יחשוב כדעתם. Unity and agreement – desirable in their own right - became insular. Their air-tight logic turned into a suffocating collectivity. Within the confines of their own language, the people of Babel could no longer understand any alternative but their own. So taken by their “one set of words”, they could no longer tolerate anything foreign to it. live, work, worship, study, marry and even shop in separate “lands”, receiving their news from “information siloes” in which they hear only what they already think to be true. Have we become a series of Babels ourselves? When is the moment when shared language becomes insularity, when solidarity becomes impermeability, when talking to those who share our values becomes solipsism? I don’t have a solution to the intellectual and cultural divides in Washington. I also happen to believe that one side here is deeply correct while the other has made a grave error of judgment, one side is stuck in a tower in my opinion, the other is perhaps inching towards it. But I believe one lesson worth learning this week is that we need constant safeguards from becoming siloed in the “land of one language and one set-of-words”, and we need to ensure that our opponents don’t silo themselves off either. And they had to stop building the city. Therefore its name was called Babble. It is the tale of the invention of foreign languages, the creation of bafflement. 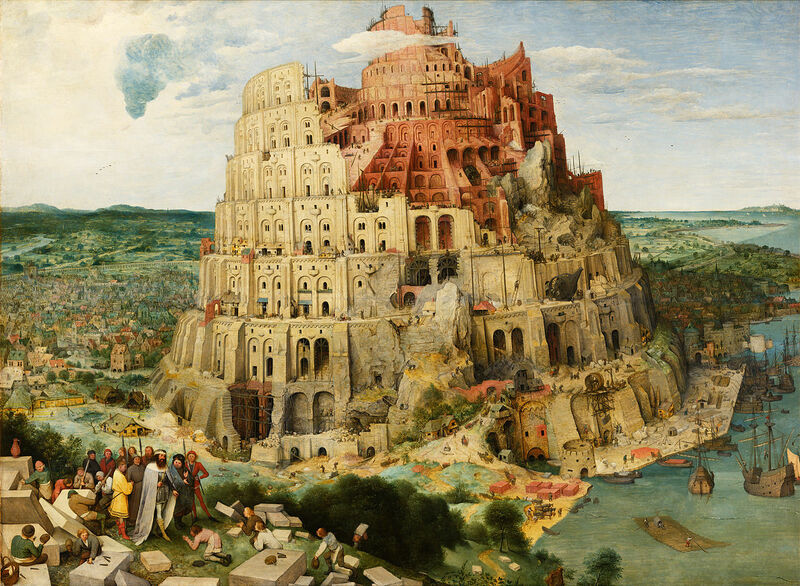 Learning to decipher a foreign language, exposing oneself to the incomprehensible, recognizing that one person’s Babble is someone else’s common sense, are crucial safeguards against the destructive insularity of Babel. I do not apologize for the fact that I understand myself and the world through the boundaries of my own language, but I know that there are others languages out there, and that makes a world of difference. If we’re ever going to build some towers together, we’re going to have to make room for a whole lot of affable bafflement, otherwise we’ll never get very far. p.s. Inspired by the Tower of Babble, and in the spirit of the ridiculousness of some of our leaders, I have been playing Bob Dylan’s 1961 rendition of a “foreign song I learned in Utah”. Now all the land was of one language and one set-of-words. And it was when they migrated to the east that they found a valley in the land of Shinar and settled there. Come-now! Let us bake bricks and let us burn them well-burnt! So for them brick-stone was like building-stone, and raw-bitument was for them like red-mortar. Now there will be no barrier for them in all that they scheme to do! And from there, God scattered them over the face of the earth. א וַיְהִי כָל-הָאָרֶץ, שָׂפָה אֶחָת, וּדְבָרִים, אֲחָדִים. ב וַיְהִי, בְּנָסְעָם מִקֶּדֶם; וַיִּמְצְאוּ בִקְעָה בְּאֶרֶץ שִׁנְעָר, וַיֵּשְׁבוּ שָׁם. ג וַיֹּאמְרוּ אִישׁ אֶל-רֵעֵהוּ, הָבָה נִלְבְּנָה לְבֵנִים, וְנִשְׂרְפָה, לִשְׂרֵפָה; וַתְּהִי לָהֶם הַלְּבֵנָה, לְאָבֶן, וְהַחֵמָר, הָיָה לָהֶם לַחֹמֶר. ד וַיֹּאמְרוּ הָבָה נִבְנֶה-לָּנוּ עִיר, וּמִגְדָּל וְרֹאשׁוֹ בַשָּׁמַיִם, וְנַעֲשֶׂה-לָּנוּ, שֵׁם: פֶּן-נָפוּץ, עַל-פְּנֵי כָל-הָאָרֶץ. ה וַיֵּרֶד ה’, לִרְאֹת אֶת-הָעִיר וְאֶת-הַמִּגְדָּל, אֲשֶׁר בָּנוּ, בְּנֵי הָאָדָם. ו וַיֹּאמֶר ה’, הֵן עַם אֶחָד וְשָׂפָה אַחַת לְכֻלָּם, וְזֶה, הַחִלָּם לַעֲשׂוֹת; וְעַתָּה לֹא-יִבָּצֵר מֵהֶם, כֹּל אֲשֶׁר יָזְמוּ לַעֲשׂוֹת. ז הָבָה, נֵרְדָה, וְנָבְלָה שָׁם, שְׂפָתָם--אֲשֶׁר לֹא יִשְׁמְעוּ, אִישׁ שְׂפַת רֵעֵהוּ. ח וַיָּפֶץ ה’ אֹתָם מִשָּׁם, עַל-פְּנֵי כָל-הָאָרֶץ; וַיַּחְדְּלוּ, לִבְנֹת הָעִיר. ט עַל-כֵּן קָרָא שְׁמָהּ, בָּבֶל, כִּי-שָׁם בָּלַל ה’, שְׂפַת כָּל-הָאָרֶץ; וּמִשָּׁם הֱפִיצָם ה’, עַל-פְּנֵי כָּל-הָאָרֶץ.